The manager of Ireland’s Group E opponents will leave his post after the tournament. Conte has been in the job since 2014. ITALIAN FOOTBALL FEDERATION (FIGC) president Carlo Tavecchio has announced Antonio Conte will leave his role as Italy coach after Euro 2016. 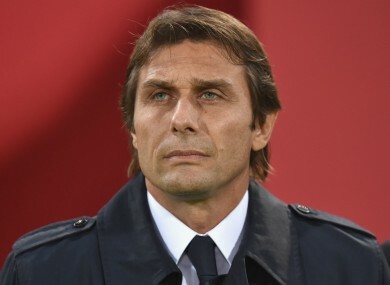 Conte’s future with the national team has been in doubt in recent months with a return to club management with Chelsea widely reported. And now his exit has been confirmed, Tavecchio telling reporters on his way into an FIGC board meeting: “Conte will leave the national team after the European Championships. Tavecchio’s announcement should pave the way for Chelsea to make their move for the 46-year-old, the Premier League club looking for a permanent replacement for Jose Mourinho since his departure in December. Guus Hiddink has been in interim charge at Stamford Bridge since Mourinho’s exit, winning eight of his 18 games in charge, but they are out of all cup competitions and languishing in mid-table in the league. Email “Next stop Chelsea? Italy boss Conte will step down after Euro 2016”. Feedback on “Next stop Chelsea? Italy boss Conte will step down after Euro 2016”.